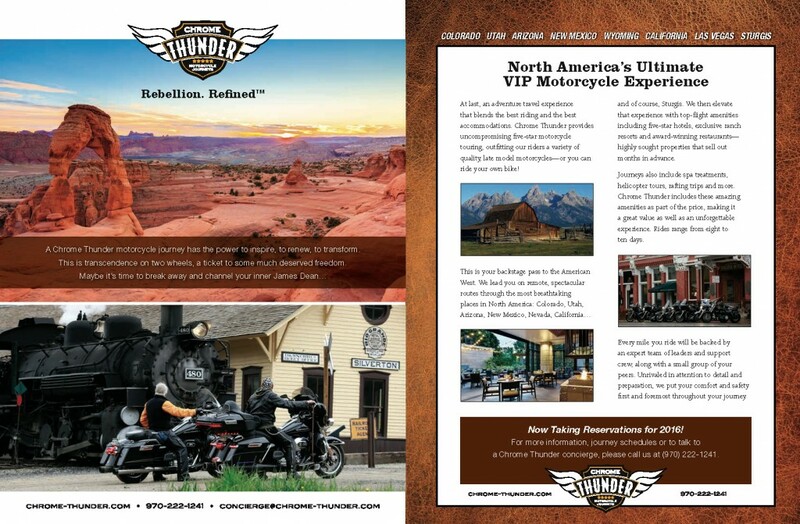 As part of an integrated marketing and advertising campaign for client Chrome Thunder, we recently developed a two-page ad for a leading U.S. motorcycle touring magazine. The campaign will include national PR, web, print and digital advertising, social media, direct marketing and event marketing. Chrome Thunder is America’s only true VIP motorcycle experience. As an entirely new adventure tourism model, the company provides uncompromising motorcycle journeys, leading riders on spectacular routes through the most breathtaking places in North America, and then elevating that experience with top-flight amenities including five-star hotels, exclusive ranch resorts and spas, crystal and linen camping, helicopter tours, rafting trips and more.